Kaizer Chiefs have welcomed the sentencing of some of their fans who were involved in the infamous Moses Mabhida chaotic incident over a year ago. The ugly scenes took place after the Nedbank Cup semi-final match between Chiefs and Free State Stars at the Moses Mabhida Stadium. READ: WATCH: CHIEFS FANS TURN VIOLENT AND DESTROY STADIUM! Hooligans brutally attacked security guards, damaged parts of the stadium and some media equipment was destroyed while the players and technical staff from both teams ran for their lives. Kwezilomo Madiba (35) was sentenced to three years in jail for assaulting a security guard. His other co accused John Memela (32), Siphosethu Khumalo (29), Cebolendoda Hadebe (21), Douglas Mkhize (42), Nolwethu Cokotha (33), Zibongile Njova (33), Sihle Zungu (27) and Dennis Thusi (35), were all given three-year suspended sentences and 12 months’ house arrest. READ: PICS & VIDEOS: CHIEFS FANS PUNISHED! They must do community work and go for anger management. Kaizer Chiefs Chairman, Kaizer Motaung, has welcomed the punishment handed down to the perpetrators and hopes it will send a strong message. 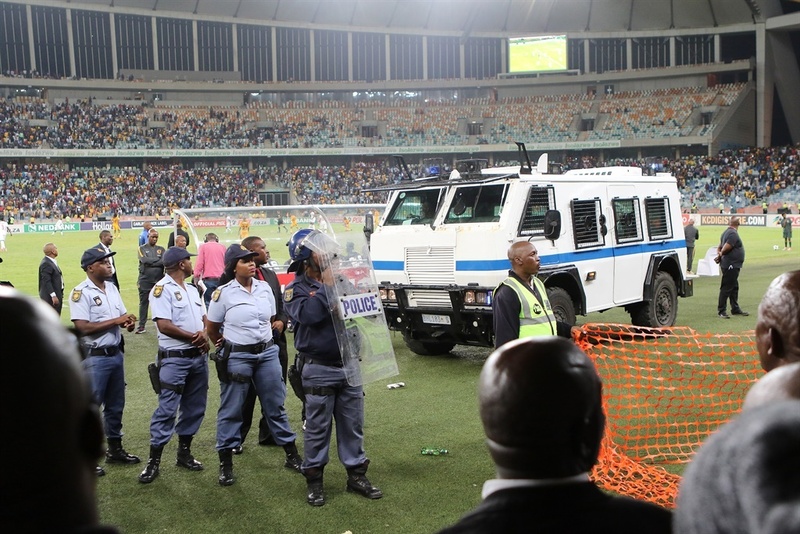 A similar incident took place at the Dr Molemela Stadium on Sunday where angry Bloemfontein Celtic fans invaded the pitch, causing chaotic scenes which led to the match against Cape Town City having to be called off. READ: ANGRY CELTIC FANS DISRUPT MATCH! “We truly welcome the sentencing of the nine people who were responsible for the injuries to security marshals and damages to property amounting to millions of rands,” Motaung said in a statement. “Stadiums are and should always be child-and-woman-friendly environments. Families must be able to attend games with no worries of experiencing any violence. Barbaric acts of the senseless violence we witnessed in Durban last year endanger the lives of innocent people and cannot be tolerated under any circumstances.